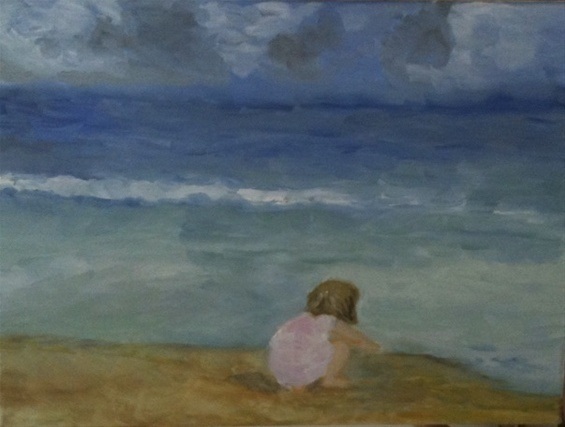 Little girl near the sea. My name Joke Laan, born in Haarlem and I work in health care. Not so long ago, in 2012, I started painting. I am inspired by Isaac Israels during an exhibition in De Hallen Haarlem. In particular, his way of painting and his colors appealed to me. It is not so hard to imagine that painting became a part of my life. What started with "I'm just trying to paint with girlfriend Tecla Trossel" has become a daily passion. In the meanwhile, I took lessons from William Bergisch. 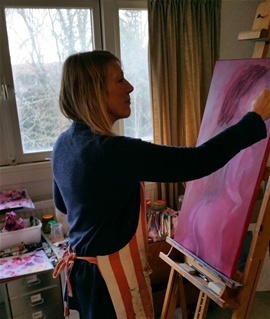 After that I painted for 2 years at the Studio A'rtistiek with Sjak Janssen in charge. The every day, but trapped in silence is what inspires me. Particularly details are important to me. Light, the female contour and the fascinating colors of the sky. That's what my work is about. The sea and the beach, but also the female body, I see as an inexhaustible source of inspiration. My preference is oil paint on canvas and I sign my paintings with JO. Although we have attempted to show the paintings as natural as possible, the colors can differ from the original anyway.